Buenos Aires, 14 January 2019: The Group of Twenty (G20) is the premier international forum for economic, financial and political cooperation: it addresses the most important global challenges and aims at creating public policies to resolve them. Together, the G20 members represent 85% of the global gross domestic product, two thirds of the world’s population and 75% of global trade. The G20 meetings are enriched by the participation of international partner organizations, guest countries and interest groups that represent different elements of civil society. Under the Argentina Presidency in 2018, the main theme and objective of the G20 agenda was “Building consensus for fair and sustainable development”. Ensuring a sustainable food future, while promoting gender equality. With the objective of providing concrete policy recommendations to the G20 governments, the B20 offers the opportunity of integrating working groups in the search for international consensus and best practices related to topics of high relevance to the sustainable development agenda, including the future of work, energy and infrastructure for development, sustainable food system and sustainable climate. Climate action and sustainable use of resources. In a nutshell, the priorities defined by the G20 and the B20 reach across the Agenda 2030 and the Sustainable Development Goals (SDGs). The alignment with the Agenda 2030 was one of the primary inputs that CEADS aimed at along the process, since the definition of the agendas through to the prioritization of policy recommendations. The G20 Leaders’ declaration reaffirms their commitment to leading the transformation towards sustainable development and support the 2030 Agenda as the framework for advancing this goal and the G20 Action Plan. The Buenos Aires Update outlines the G20 current collective and concrete actions towards achieving that Agenda. Recognizing the SDGs as the most ambitious multilateral consensus, the B20 adopted the Agenda 2030 as a fundamental guide for formulating policy recommendations to the G20. And one of CEADS’ main tasks as concept partner was to guide and link the priorities and recommendations of the B20 working groups with the Agenda 2030 and its goals, emphasizing the impact and contribution of the B20 recommendations towards aforementioned goals. It is important importance to point out that almost 75% of our proposed action plans are implementable at national level and should therefore drive a compelling agenda for G20 governments. In turn, the outcome of enacting this agenda could become a set of best practices to be shared with other non-G20 countries, leading by example. On the other hand, the remaining 25% of the B20 action plans are meant to be discussed and implemented within multilateral forums. The core mandate of the group is to commit the global business community and the G20 leaders to accelerate the transition towards a sustainable, equal and low-carbon emissions future, as outlined by the SDGs and the Paris Agreement. Hence, the first line of recommendations is titled accelerate the transition to a low-carbon future, promoting the replacement of energy sources of high carbon intensity and the electrification and digitalization of the energy system. The second key recommendation is to ensure access to affordable, reliable, clean and modern energy for all, including provision of decentralized and clean solutions for homes and communities. All of the above represent a clear contribution to SDG 7 (Affordable and Clean Energy) and SDG 13 (Climate Action), and impacts many more goals, since access to sustainable energy services is fundamental for economic development (SDGs 8, 12), ending poverty (SDG 1), health (SDG 3), education (SDG 4), food systems (SDG 2), the development of infrastructure and communications (SDGs 7, 11) and the reduction of inequalities (SDGs 5, 10). Another line of our recommendations aims at incentivizing energy efficiency in all sectors – industrial, transport and residential – and promoting resource efficiency and circular economy in all industries. To achieve this, G20 governments need to eliminate legal barriers, reward the saving and efficient use of energy and resources, share information and encourage alliances and collaboration between interest groups. It is worth mentioning that including recommendations on circular economy and circular business models was a specific input by CEADS to the B20 agenda. The same was rapidly adopted and valued by the B20 business community, highlighting it within the three key pillars of its policy recommendations to policymakers. The most relevant link is between circular economy and SDG 12, which calls for ensuring sustainable consumption and production models through the efficient use of natural resources. But this is not the only link. There are many SDGs that will be impacted positively by moving from a linear to a circular economic model, such as SDG 3 (health and wellbeing), SDG 6 (clean water and sanitation), SDG 7 (affordable and clean energy), SDG 9 (industry, innovation and infrastructure), SDG 11 (cities and sustainable communities), SDG 13 (climate action), SDG 14 (life under water), SDG 15 (life on land) and SDG 17 (partnerships for the goals). Lastly, another distinctive contribution of CEADS to defining the recommendations of the Energy and Sustainability working group was the focus on adaptation to climate change, in direct connection with SDG 13. In alignment with the recent IPCC report there is no prosperity scenario in any country if we don’t address climate change and its consequences. Therefore, adaptation to climate change occupies a relevant place in the group’s recommendations. Along the same line, during the Argentine Presidency 2018, the G20 established a working group dedicated specifically to climate sustainability, whose primary thematic line are adaptation to climate change and the development of resilient infrastructure. The climate-related recommendations aim at generating capacities to anticipate impacts in vulnerable sectors, integrating adaptation measures into investment and national development plans, improving risk management and emergency responses and promoting financial mechanisms to implement adaptation measures (taking into account that climate adaptation policies only receive 7% of all climate funds). If we are to avoid climate change to erode the development reached so far by our societies and to threaten the achievement of the SDGs, we have to accelerate our pace and scale up individual actions through alliances between all parties (SDG 17). The Sustainable Food System task force was a new inclusion in the B20 2018 edition. This topic had been absent from the B20 agenda since it was last addressed in 2012 under the Mexican presidency of the G20, under the title Food Security. The inclusion of this working group as a B20 priority area is a clear reflection of not only the Argentinian presidency’s focus on pursuing zero poverty, zero hunger and sustainable development goals as part of the G20 agenda, but also the massive impact that working towards a more sustainable global food system can have in achieving such goals. B20 also recognizes the fact that governments cannot strive to achieve these goals on their own, and that participation of the private sector through multi-stakeholder partnerships is crucial. Reducing barriers to global food trade. The Taskforce has identified the relevant SDGs that are to be directly impacted by every recommendation, which translates into 9 Goals and 30 concrete targets. It also defined a set of Key Performance Indicators (KPIs) to monitor the progress of these initiatives, aligned with the global indicator framework for the 2030 Agenda. The key actors in the global food system need to increase efforts to ensure food security and adequate nutrition in order to eradicate hunger and all forms of malnutrition by 2030, in line with SDG 2 and SDG 17. Sustainable food systems have a key role in the mitigation of climate change and the conservation of the environment and biodiversity. It is imperative to turn the food value chain into a positive environmental actor that sustainably utilizes and restores natural resources. (SDGs 2, 9, 12, 13, 14, 15, 17). Global food producers must broadly adopt sustainable agricultural practices to mitigate, adapt to and increase resilience to climate change (SDGs 2, 12, 13, 17). In addition to broad global adoption of existing agricultural best practices, new and innovative technologies need to be developed and deployed across the food value chain to increase yields and maximize resource efficiency (SDGs 9, 12). The global food trade must function fluidly while minimizing waste to ensure food security. 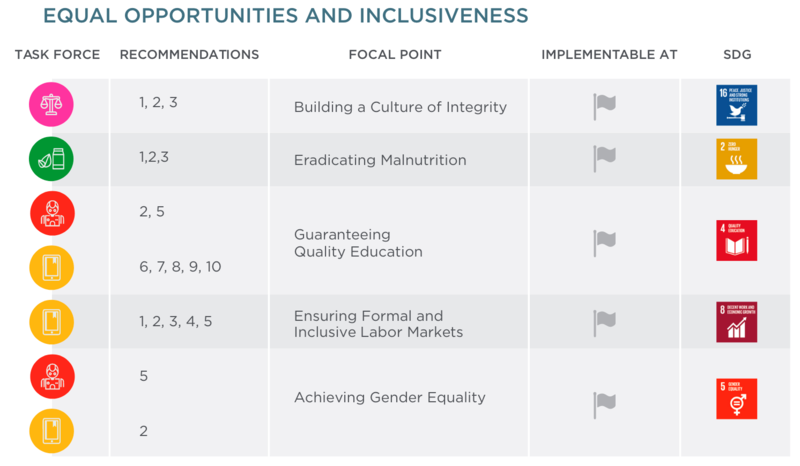 Efficient markets across countries ensure that food is accessible and properly priced across the world (SDGs 2, 10, 17). In addition, food value chains must function more efficiently and reduce (or find alternative uses for) food that is lost or wasted. Minimizing food loss and waste can be one of the most effective ways to achieve a more sustainable food system that provides food security in a resource-efficient way (SDGs 12.3). In the view of the Sustainable Food System taskforce’ s Chair, the main lesson learned is that the G20 process, and the dialogue with and among the engagement groups, is a key enabling institutional platform to deliver on this long-term sustainable development agenda. As stated in WBCSD’s CEO Guide to the SDGs, this agenda is beyond the reach of any one company and will require collaboration across sectors, supply chains and economic systems, as well as innovative partnership with governments and civil society. Realizing the SDGs means collaboration between a critical mass of companies at the industry level. At a sector-level, the G20/ B20 process has the potential to act as a platform to set a collective vision and enhance sectorial collaboration to realize sector transformation. At a policy level, it also plays a part as an advocacy platform for the introduction of key policy and finance enablers that will help to achieve the SDGs.